Arromanches, Juno Beach, Canadian Cemetery in Beny-sur-Mer. Possibility to see Pegasus Bridge if skipping the Canadian cemetery. 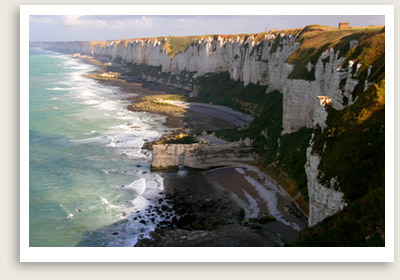 Or customize your private Normandy tour to include your choice sites. Inquire. Departure Points: Honfleur, Bayeux, Cherbourg, Caen. Also as a Paris day trip. Private Normandy Landing Beaches Tour Includes: Private transportation, guide service, taxes, tolls, parking. Note: You may also arrive in Caen from Paris via train. In this case, you will end the tour with the guide dropping you at the train station in Bayeux or Caen. We will make ALL the arrangements including the purchase of the train tickets and set up of a private transfer to Paris station with assistance. Enjoy an informative and engaging private tour of Normandy, whose D-Day landing beaches played a key role in the fall of Nazi Germany. Your Normandy tour takes you Gold, Juno landing beaches. After your guided tour of Arromanches, site marked by a cross where General De Gaulle landed. You will drive by Courseulles’ old port, Juno Beach — the most complex military maneuver of the beach invasions. This and other Canadian landings were the most costly in terms of casualties and yet had the most impact of all the allied divisions on D-Day. Your Normandy private tours takes you inland to Beny-sur-Mer, a Canadian war cemetery, where the Canadian 3rd Division and fifteen airmen killed in the Battle of Normandy are buried along with others killed in the Battle of Caen and during D-Day assault of Juno beach. Time permitting, you will visit Pegasus bridge.